Whether your Thanksgiving plans include turkey, turducken (maybe next year!) or Tofurkey, we all have one thing in common on this day: the preparation of an exceptional meal. We all want to make sure we’re getting the best possible ingredients to set the stage for our dishes, but did you know that many ingredient staples are made with artificial flavors, preservatives and hydrogenated oils? We only get to celebrate this delicious holiday once a year, so make sure you’re creating the best possible dishes. Swap conventional go-to’s for high-quality items from 365 Everyday Value at Whole Foods, and you’ll be receiving extra thanks from your guests and your wallet. Stuffing and gravy are a must have at Geek Headquarters. Skip those boxes of conventional chicken broth for 365 Everyday Value® Organic Chicken Broth to elevate your special stuffing and gravy. The broth is made from Free Range Chicken and is a part of Whole Foods Market’s Global Animal Partnership 5-Step® Animal Welfare Rating. Another favorite of ours is green bean casserole! 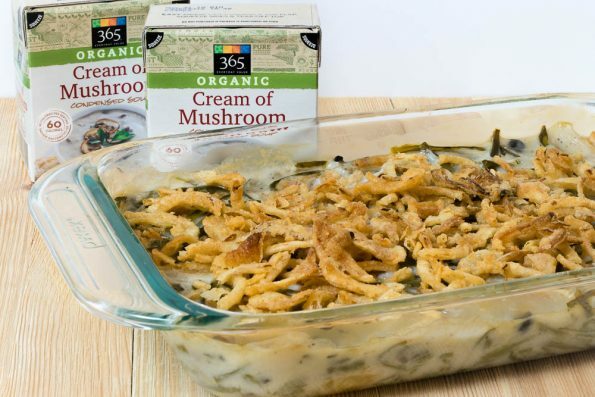 Take your green bean casserole to the next level with 365 Everyday Value Organic Cream of Mushroom Condensed Soup. With no MSG, artificial flavors or preservatives, this ingredient staple is a winner and you’ll feel better about serving this super rich side. 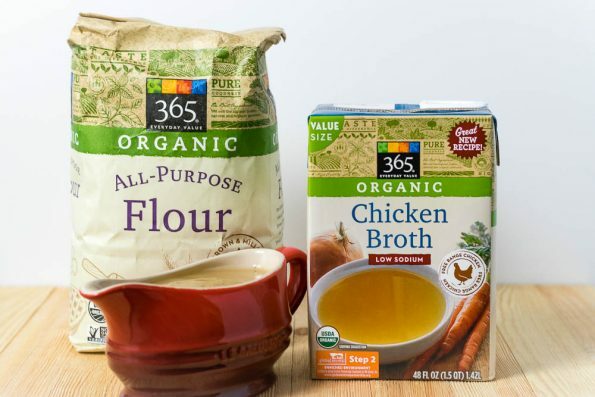 For all of your baking needs (like those pumpkin and pecan pies), reach for 365 Everyday Value Organic All-Purpose Flour. The flour is grown and milled in the USA, Non-GMO Project verified and is never bleached or bromated. Pumpkin pie is just not the same without some sort of whipped topping. 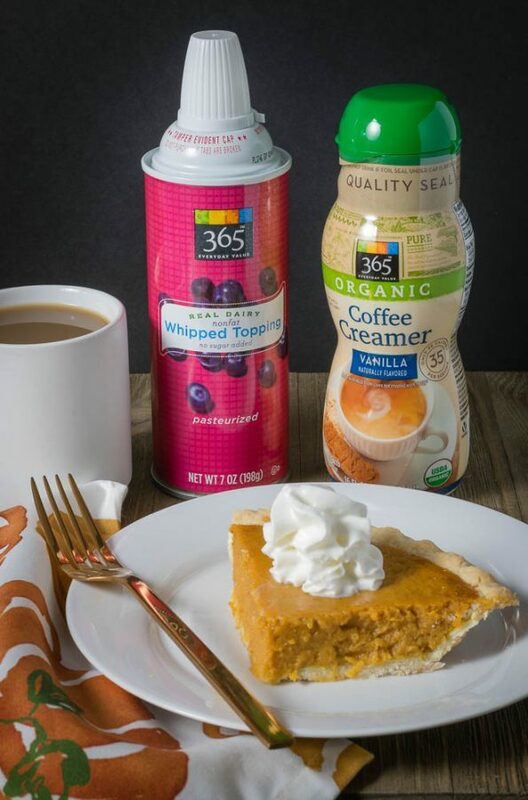 Top your pumpkin pie with a dollop of 365 Everyday Value Real Dairy Nonfat Whipped Topping. It is made with no added sugar and simple ingredients – plus, no artificial colors or flavorings! End your holiday meal with a warm beverage and a splash of 365 Everyday Value Organic Coffee Creamers in Hazelnut and Vanilla. Both are naturally flavored, with only 35 calories per serving. Compare this label to the conventional creamer and you’ll find no hydrogenated oils, high fructose corn syrup or artificial flavors. We hope these tips help make your Thanksgiving a fantastic one! There is no need for the quality of your meal to suffer in order to save a few bucks! Having tried out these products ourselves, we can certainly say that they will easily become holiday staples in our household!